The big and old blue star is starting to expand and to blow its hull out into space. This it doesn't do spherical. 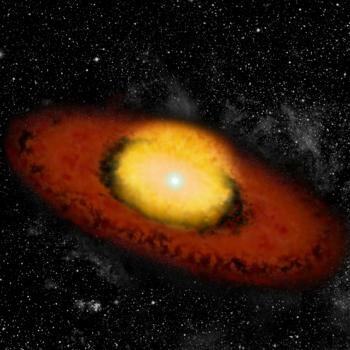 The star before already was surrounded by a dust disk. But planets there are admittedly rather implausible, because the time it takes to form planets should be longer than the life-span of a very big star.